One of the most popular and widely known cloth diapering companies is FuzziBunz, makers of pocket diapers. They began out of necessity in 1998 when founder Tereson Thomas needed something to help out her three-moth old son’s chronic diaper rash. Her response was to hand sew a diaper that was easy to clean, prevented leaks, was economical, and would keep her baby dry. 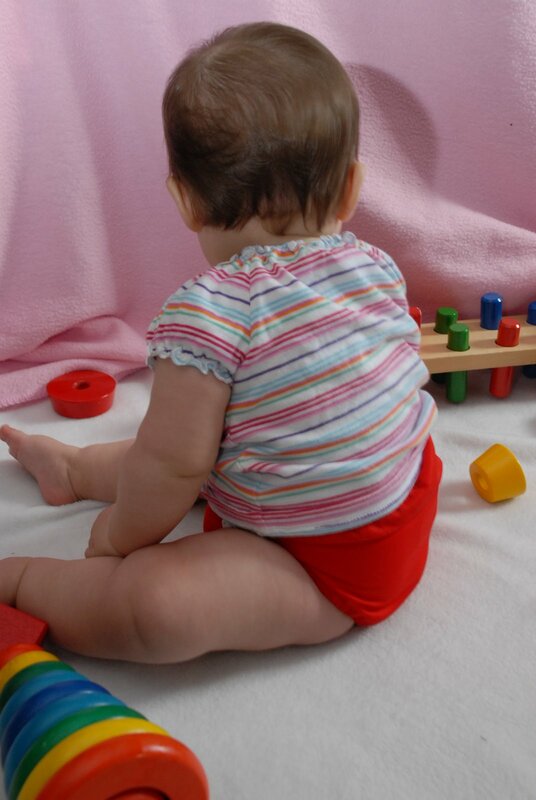 Eleven years later, FuzziBunz is the top-rated cloth diaper company according to DiaperPin.com and is worth multi-millions of dollars. What makes them so special? FuzziBunz offers a range of diapers including One Size and Perfect Size pocket diapers. They offer all of the regular sizes as well as a range including XS, Petite, and XL to fit your special needs or hard to fit child. Their diapers come in a wide range of PUL fabrics on the outside (colors and prints!) with a white microfleece on the inside to keep baby dry. There’s a pocket in the back of the diaper that allows you to adjust the absorbency as needed. FuzziBunz sent me a size medium red diaper to try out. We’ve used FuzziBunz previously, but found that the diaper they sent me is a newer and better design. The snaps on it allow for good adjustment, and we only have leaking problems if the fleece part isn’t tucked in right. The diaper runs about $17.95 and is said (by the company) to be able to withstand over three years’ worth of wear and tear, and also to have the ability for easy elastic replacement if need be. It’s not a chunky diaper on your baby either, which is definitely a nice thing when you’re trying to pull a pair of pants over their bums. Here’s how you can win this diaper worth $18.95: visit the FuzziBunz website at http://www.fuzzibunz.com/ and tell me which print you’d like the diaper in. Choose wisely–this is what you’ll be getting if you win! Leave a comment here telling me along with your email address. The contest will stay open until approximately 1530 hours, EST on August 7, 2009. Earn extra entries (leave comments with an email address) by spreading the word. Grab my buttons, follow my blog, subscribe to me, fav me on Technorati…you know the drill! Good luck. The daisy prints are all my favorite, but my husband wouldn't let me put them on our son. So I would have to go with red or orange. I would want mine in sage, it's a pretty color and can be unisex, so I can hang on to any cloth diapers for future little ones! I must say I like the turquoise if it is available. I have your “Life More Simply” button on my blog. I have your “Diaper Extravaganza” button on my blog. I like the red diaper — very nice. You are now on my blog roll!